A guy from Vermont crashes in a tropical paradise ruled by angry gods. It’s a long way home. 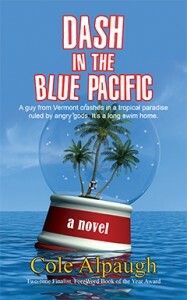 Dash in the Blue Pacific (5×8 Trade Paperback ISBN: 978-1-60381-252-8, 256 pp., $14.95) is Cole Alpaugh’s fourth novel. A lone survivor of a plane crash in the South Pacific is held captive by a tribe of shabby natives. As he heals, Dash learns what it truly means to belong to the human race. As in Alpaugh’s first two novels, Dash in the Blue Pacific contains elements of magical realism. Alpaugh’s third novel, The Spy’s Little Zonbi, and his second, The Turtle-Girl from East Pukapuka, were finalists in the 2014 and 2013 Foreword Book of the Year Awards, respectively. Alpaugh’s first book, The Bear in a Muddy Tutu, set in a ragtag traveling circus, garnered eleven five-star reviews on WorldCat. “The weird parts work because Alpaugh integrates them into a story that is physically raw and wickedly funny. Dash is as incredulous about all that is happening as anyone, and his self-conscious skepticism keeps the magical elements from seeming off-the-wall. Little by little, Dash’s conversations with Willy reveal Dash’s deeper emotional wounds, and offer another interpretation for his dreamlike visions. Taken simply as a comic adventure story, Dash in the Blue Pacific is thoroughly entertaining. When you consider the other elements—racial tensions, human grief, and spiritual redemption—it takes on new levels of meaning. Book clubs will be talking about this one.” Read more…. “Cole Alpaugh is a grand comedian, and the conflicts and themes which exist in uncharted territory for traditional novels work well with his droll craft. The novel is full of magical wonders, melancholic gods, invasive spiders, and hilarious blunders from both Dash and the natives. ‘Boring’ and ‘predictable’ would be the last two words you’d use to describe Alpaugh’s novel.” Read more…. Dash does not feel lucky. When his plane crashes in the South Pacific on a honeymoon flight to Sydney, Australia, he is already a broken man, having left his cheating fiancée at home in Vermont. Dash is the crash’s only survivor, and the natives who find his battered body blame him for poisoning their fish with spilled jet fuel. Once he has sufficiently recovered, they plan to offer him as a human sacrifice to their Volcano God, who they believe downed his plane and cursed them with drought and hardship. While Dash awaits his fate, he abandons all hope of rescue. But his new life has its moments. He meets ten-year-old Tiki, daughter of the chief and an innocent who dreams of being “chosen” by the soldiers who occasionally visit their island. He also conjures up an imaginary friend, Weeleekonawahulahoopa—Willy, for short. Willy is half-man, half-fish, a sometime god who resigned his lofty status after failing to save his people from drowning. As Dash comes to understand the natives who hold him captive and confront his own unhappy past, he suspects that he might not be so unlucky after all. Cole Alpaugh is a former journalist, having worked at daily newspapers along the East Coast, as well as spending several years as a war correspondent in numerous hot-spots around the world for Manhattan-based news agencies. His work has appeared in dozens of magazines, as well as most newspapers in America. Cole is currently a freelance photographer and writer living in Northeast Pennsylvania, where he spends his afternoons watching his daughter hit fuzzy yellow balls and ski through slalom gates. Click here to find him online. The girl’s large brown eyes found him, and he was embarrassed about his drooping underwear and what she must have witnessed. “Not your fault. Manu says the Volcano was angry. She threw a stone and made your airplane fall. There’s another.” She pointed past him, and he turned to look up at shiny hints of distant metal, long contrails beginning to twist apart at their far ends. “Just one stone.” She used her thumb to indicate the barren mountain rising from the center of the island, a soaring brown monolith producing a ribbon of white smoke. Tiki shrugged, got to her feet. A pretty child—maybe ten years old—with wide eyes and smooth skin, she had a mass of thick hair halfway down her back, brushed to a deep shine. She wore the same style underpants as everyone else. The narrow trail of smoke was an unbroken line connecting the mountain to the horizon. Would it bring rescue? How far did it hold together for people to see? If it really came from the mouth of a god, maybe it traveled all the way to where they’d lifted off, the perfect white smoke mixing with the yellow smog over Los Angeles. The thought made him feel less isolated, if only for a few seconds. She was looking up at him, smiling with a flawless set of round teeth that he caught himself inspecting for bits of human flesh.